Day -16: An Introduction. Also, There Is A Pile In Our Basement. There is a very large pile of boxes in the basement of one of the buildings of the University of British Columbia. The pile keeps getting larger, and several groups of people are milling about the pile, adding things to it, duct-taping parts of it, labelling it, and stacking parts of it on other parts. It’s a very important pile, and we’ve been working on it for months. 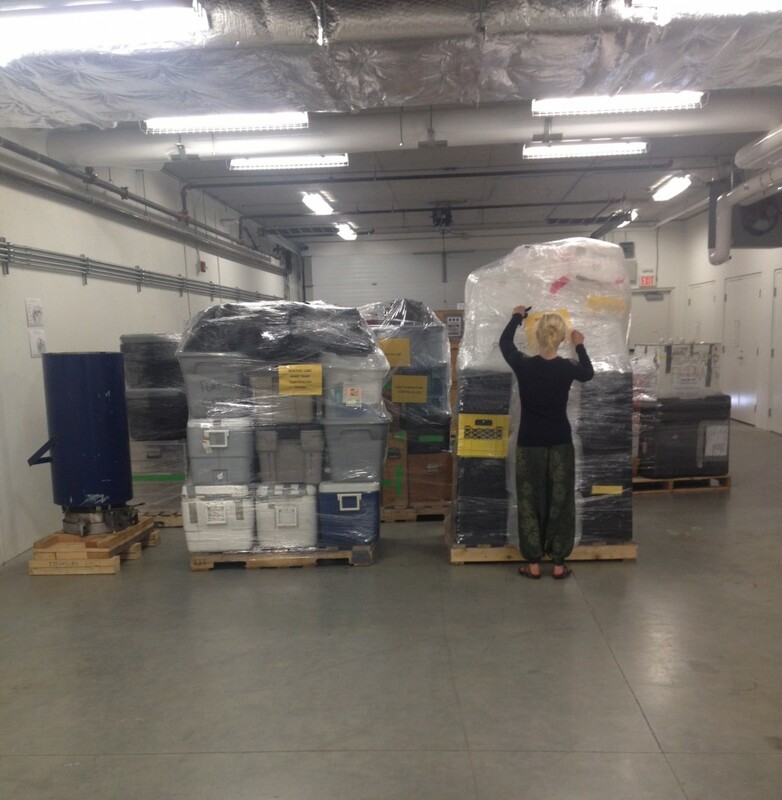 This is the pile of scientific equipment that we are taking to the Arctic Ocean this summer. Today, after long preparations, we are ready to ship our pile across the country, to Québec City. On July 10, 44 scientists from 14 institutes (and a hard-to-pin-down number of countries) will set sail from the port of Québec City on board the Canadian icebreaker the CCGS Amundsen on a summer-long research expedition to the Canadian Arctic. The expedition is part of the GEOTRACES program, which generally aims to better understand the distribution of trace elements in the ocean. In addition to conducting trace element studies, many of the participating scientists do research in other fields as well. Together, we’ll be looking at things like phytoplankton, climate-active gasses, and ocean acidification – trying to discover the unknown in the furthest reaches of the north. For now, however, we are looking at this rather formidable pile. The amount of logistics involved in a research expedition is staggering, and even with nested to-do lists, we are almost overwhelmed. 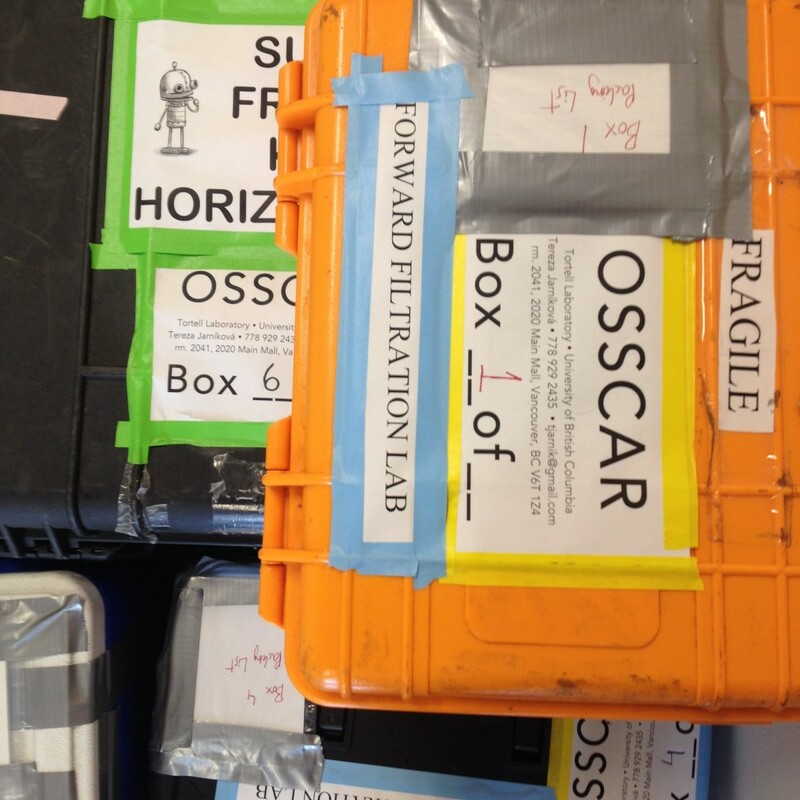 We have expensive and fragile instruments with involved acronyms (PFPD – Pulse Flame Photometric Detector! FRRF – Fast Repetition Rate Fluorometer! MIMS – Membrane Inlet Mass Spectrometer!) , but we also have large quantities of much more mundane things that cannot be forgotten: pipettes, gas-tight bolts, rubber boots, notebooks, computers, toolboxes, and veritable mountains of glass and plastic sampling bottles. This provides a challenge: if we forget anything, we will have to sail without it, potentially jeopardizing our research. There will be many challenges ahead, but for now, the one to focus on is this pile. Expedition scientist Nina Schuback tends the pile. Boxes stacked on boxes, which are stacked on more boxes. A quick introduction at the end: My name is Tereza Jarníková, and I am a graduate student in Dr. Tortell’s research group at the University of British Columbia, where I do research on climate-active gasses. On this blog, I will be writing a sort of ship’s diary for the CCGS Amundsen’s 2015 expedition, documenting our journey north. Through this blog, I will also be relaying messages to the ship – we would be glad to hear from you! Would you like to ask us questions about our research, the Arctic, life on board an icebreaker, or anything else? You can send words to the Arctic here. Please do! It will be exciting to hear from the outside world.